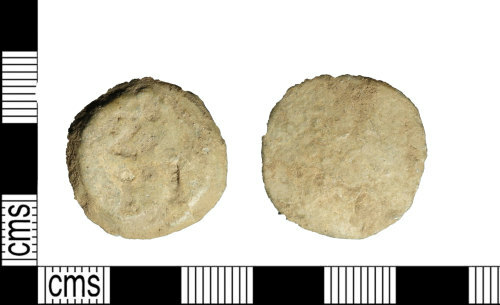 Post Medieval lead alloy object fragment, 23 mm in diameter and 4 mm thick with a weight of 10.79g. The object is circular in form and rectangular in cross section, with a tapered irregular edge. It has 2*/ II stamped on its narrower upper surface. The object is probably a tally or trade token.